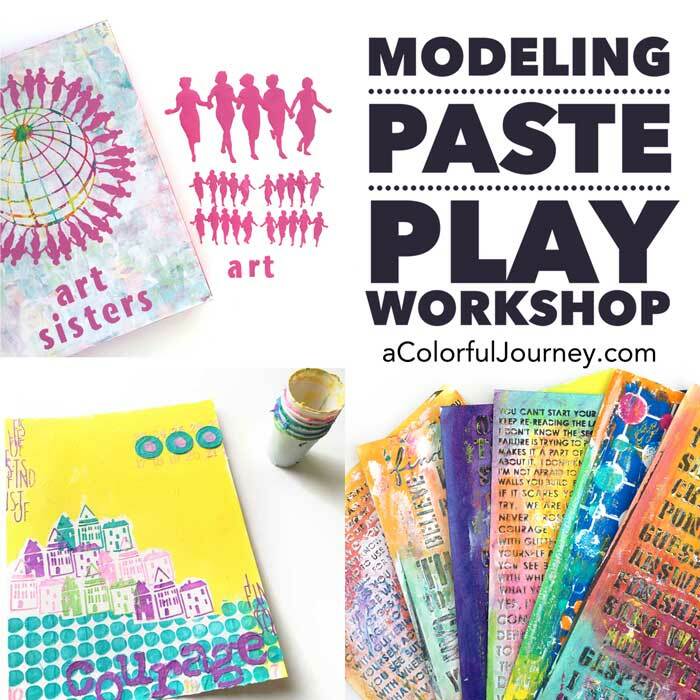 How do you get those gel prints with little bits of color here and there that give a print the wow factor and do it in one pull? 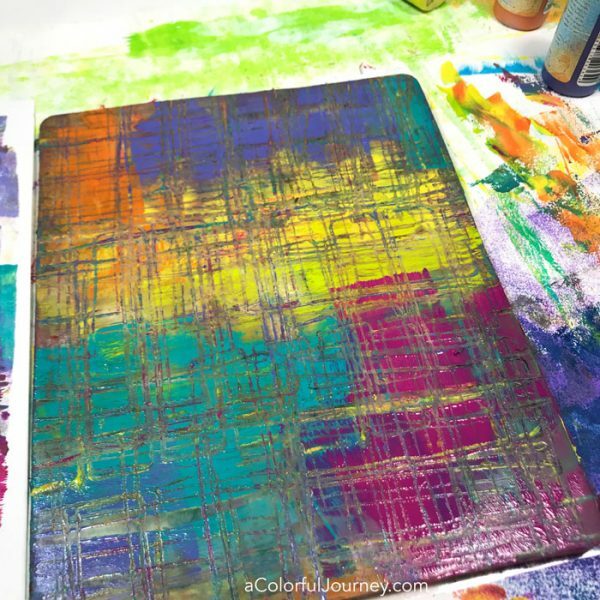 By color transference which is a fancy way of saying transferring the color from one area to another on the gel plate. What fancy tool does this? Recycled cardboard. 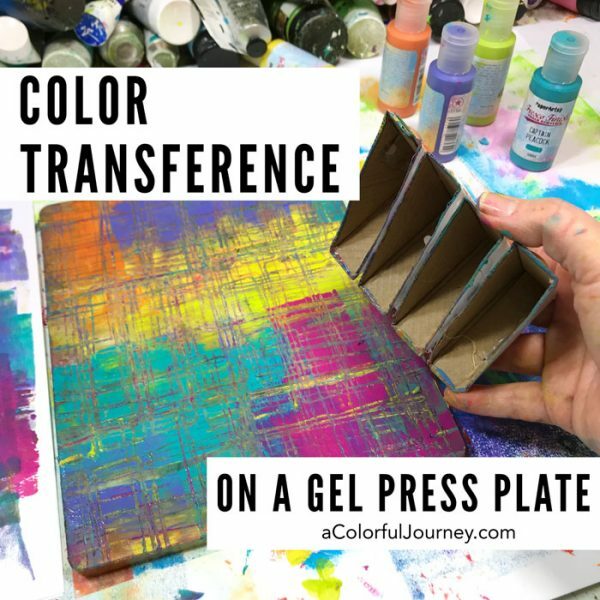 Watch Color Transference on a Gel Plate on YouTube. 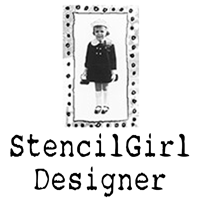 The pattern making tool created was just packing material from a picture frame. I happened to have the triangular shapes but you can use any cardboard to do this. 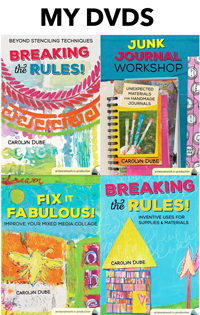 Look around for some scrap pieces you can glue together. You might be surprised by what you find. Multiple colors of paint were added to the gel plate. 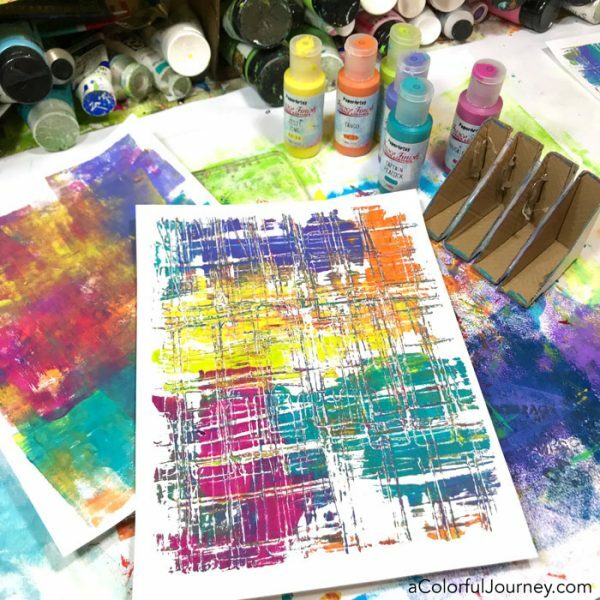 Here I used 6 colors of Paper Artsy paints. Naturally, you can add as many or few colors as you prefer. 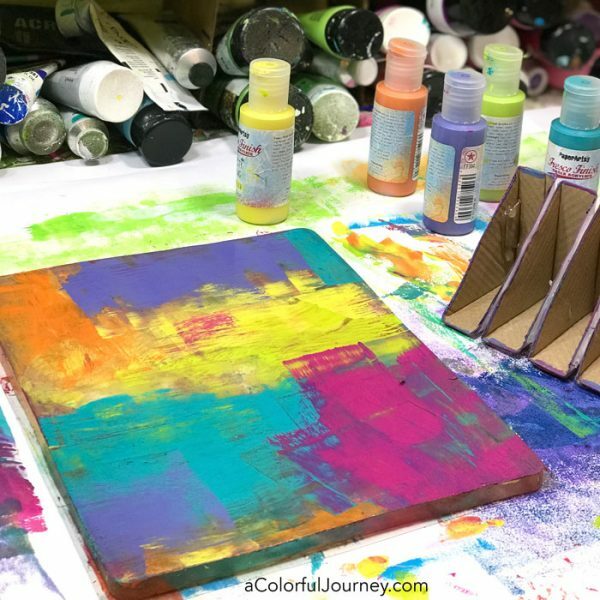 By pressing the cardboard tool into the paint over and over, the paint begins to transfer from one area to another. 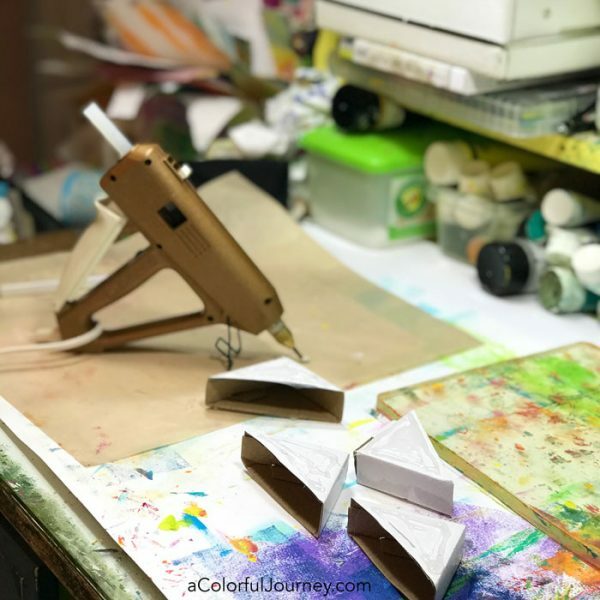 The more you do this, the more color gets transferred. Every so often, I would turn the tool which allowed for a bit of change for what colors were going where. How do you know when to stop? That’s a personal question and there is no exact answer. Do you love how it looks? Then that’s when you stop. I love very busy prints so I kept going and going to get this look. 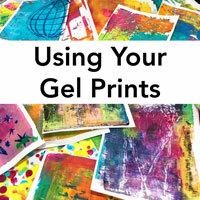 Ready for more gel printing fun? 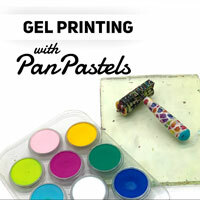 Check out the techniques and tutorials page including the Do’s and Don’ts of Gel Printing. OOOOOOOOOOOOOOOOOOH so very cool and even the wipe off roller sheet is gorgeous! I love this. I’m new to gel printing and I’m enjoying learning new things. I need one of these fancy tools! Love these prints. Great video! Love that you used something that would’ve been thrown away!! Loved this Carolyn. I collect those end pieces at work cause they are always thrown away. My plan was to use them on small canvases to make little houses. Now I have a new inspiration. Love the texture you got with the corners. I just happen to have a new frame waiting to be unwrapped!! I love this. Colors and tools are both amazing. I have tons of ‘recyclables’ waiting to be tried…. 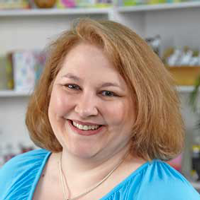 I tend to like using a sturdy paper (90lb – index card weight), it’s personal preference so any paper you like will work Lisa. Superb! Thank you for the fantastic ideas and technique how-to! I really like watching you create and teach.